For 2000 years the people of the remote mountain region of Junin in Peru have consumed a sacred medicinal root vegetable called Maca for the management of stress and to promote vitality and well-being. Children are told that Maca is the food of the brain and helps them to develop their focus and brain function. As a teenager it is used to manage and balance hormones, helping women prevent PMS and men for acne and male hormones. It is used for fertility treatment and then stress management in the middle years. As they age, for menopause treatment in women and sexual function in men. Finally, the elderly consume it to stay active, strong, mentally focused, alert and energized. Studies have shown that the locals are some of the happiest and healthy people on the planet, with many living active lives well into their 90s and beyond. So what is the secret behind this their longevity and can we associate it to this sacred medicinal root called Maca that they consume? Maca (Lepidium meyenii) is an annual herbaceous plant of the Brassicaceae family, native to the central Peruvian Andes. It grows within the range of 3500 – 4500m where the conditions provide little competition within the soil from other plants. It is related to the garden radish but possesses very different therapeutic properties due to its unusual biochemistry. It takes almost a year to grow and requires very specific conditions that are only found at these altitudes in the Andes. It is harvested annually in June/July during the dry season and is laid under the sun at altitude for 3 months to dehydrate into a dry pellet. The Inca believe this drying is essential to the medicinal properties of the plant and only consume it once it has fully dried. Once dried Maca is always consumed cooked as it is high in starch, bacteria and at risk for aflatoxin producing mould. It is traditionally boiled in teas, soups or stews as a food source and a medicinal. Scientific studies have shown that cooking raw maca actually enhances its medicinal properties and consuming it raw may pose potential health risks. To read more on this issue we recommend reading a summary of the science of Incan tradition relating to the cooking of Maca. The main medicinal properties of Maca are called macamides. These metabolites are completely unique to Maca and are responsible for most of its adaptogenic (body-balancing) activity. Their formation results from a biochemical reaction that occurs during the traditional drying and heating of Maca. Macamides preserve and increase levels of your own natural endocannabinoids in your brain like Anandamide (our bliss molecule) by inhibiting an enzyme that usually breaks these down (FAAH – fatty acid amide hydrolase). Endocannabinoids like anandamide are regulatory molecules that act like a switch in your body to reduce the negative impact of the stress response and enhance natural endocrine function. In essence, macamides build long-term strength and resilience to stress and bring the body back to a stable balance via the endocannabinoid regulation. As a result, Maca has the ability to control countless processes in the body including hormone production, pain sensation, metabolism, neurotransmitter production (serotonin), energy production, adrenal function and much more. Its mode of action is unique, it is not a stimulant, it can be used for long-term sustainable treatment and it is well tolerated by everyone. Due to it’s broad mode of action Maca has been used to manage everything from mental health, hormone balance, menopause, PMS, fatigue, fertility, pain, auto-immunity, addiction to sexual dysfunction and libido. Understanding the biochemistry of Maca makes sense as to how and why the Inca have used it for the management of stress and to promote well-being. Here in New Zealand Maca experts Seleno Health (www.selenohealth.com) study the science and traditions of Maca from Peru. 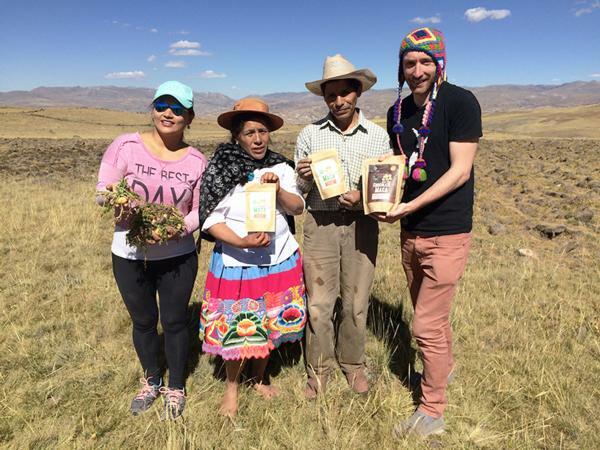 Co-founder Dr Corin Storkey (Wellington) and his partner Sally Huapaya (Peru) spend 3-4 months per year working directly with a farming community in Junin and bring Maca direct from the farm following the traditions of preparation dating back 2000 years. They believe it is up to us as conscious consumers, suppliers and retailers to protect the heritage, culture and history behind Maca and to create an ethical and sustainable way to produce it that benefits all involved. Not all Maca is created equal so before purchasing any Maca powder they recommend following five steps to ensure you are getting the right Maca.